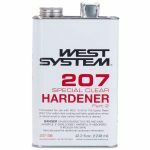 West System 207 Special Clear Hardener - Goosebay Sawmill and Lumber, Inc.
207 Special Clear Hardener was developed for coating and fiberglass cloth application where an exceptionally clear, moisture-resistant, natural wood finish is desired. Blended with 105 Epoxy Resin, 207 Hardener will not blush or turn cloudy in humid conditions. Thin film applications roll out and tip off smoothly, requiring less sanding in preparation for finish coatings. Professional and first-time builders like 207 Special Clear Hardener because it is reliable, easy to use, as does not blush. Three coats or more can be applied in one day without additional surface preparation. Fewer coats are required to fill fiberglass weave and in most cases, the final coating can be sanded the following day. Boats can be built faster. Builders also appreciate the excellent fiberglass wet-out characteristics achieved with 105 Resin/207 Special Clear Hardener, yet it won’t drain from vertical surfaces like the very slow curing, low-viscosity epoxies. 105/207 Epoxy has strong physical properties, so it can be used as a structural adhesive for gluing and laminating. It has excellent compatibility with paints and varnishes. An ultraviolet inhibitor in 207 Special Clear Hardener helps provide a beautiful, long-lasting finish when used with quality UV filtering varnish. 105/207 cures clear and colorless. We can special order Special Clear Hardener 207-SC (1.45 gal). Additional shipping charges may apply to this item. Special orders are subject to minimum quantities but can often be an “add on” to our regular restocking order. Once ordered, arrival time at our store is usually within 2 business days.